Am about to purchase a system to amplify my Gitane D500, used strictly for rhythm playing. Not interested in any of the clip-on or putty-on options. Considering the K & K Definity+pre-amp, which seems to have positive reviews. Anybody tried or know about the K & K Trinity Pro? (this one). Also would love to learn more about pickup alone vs. pickup + mic combinations. Any help would be, um, helpful. :-) Thanks in advance. Success is moving from one failure to another with no loss of enthusiasm. I've never found an amplification system that sounds better to my ear than a mic especially for getting a good rhythm sound. While a mic is not always practical for lead, it has always worked for me on rhythm, even in very noisy bars. I use a clip on ( I know) AT mic and AI Corus acoustic amp. Floor stand mics work great if you have the room. Having a guitar that is loud enough to drive the mic is helpful. If you want it I'll send it your way. It came from John's D hole. A lot like K&K, but a lot less money, is the JJB piezo pickup. This guy is the same as the K&K referred to above, for ~$50 USD. This is the one I've installed in my Altamira, 3 fiddles, a mandolin, two octave mandolins, mandola, two mandocello, two other guitars, a banjo and an upright bass. I replace the jack it comes with depending on the application. The best preamp I've found for all around acoustic instrument use is the Redeye. I just recently got a Carvin AG300 acoustic amp, and it sounds better than anything else I've used yet. thanks everybody! I've also been looking at the JJBs, but hadn't seen Prestige-330, so thanks for that Mandobart. Any info on whether a 3-piezo would be better/worse than the 2-piezo? I have onlynplayed a few gigs with it so far but now that Inhave the combi rig on my DuPont working correctly it is the closest thing to a really good mic I have yet found. McIntyre feather placed under the correct (bass) side of the bridge and an, as yet unidentified, (possibly lavalier) mic that's suspended by its cable alone about halfway between the bridge and the mouth about an inch below the top. For me the best sound yet is my Neumann KMS 105 with ART gold tube preamp played through the PA system. This piezo/contact mic stuff can sound fine but it won't be as natural as a mic. Remember I had a K&K pure Maccaferri pickup and was going to compromise with it's amplified sound, and it sounded decent, but I thought I was going to gain higher feedback resistance which I didn't so it made no sense to use it. The advantage is simplicity and it can be very clean looking if done internally. 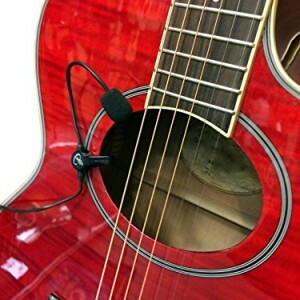 I use a Myers mic which clips to the soundhole like on the picture or a Krivo pick up depending on a place and/or my mood. But never both, mic plus a pickup to me is too much maintenance and clutter. I like the sound of both and with the Krivo pickup I can get a good rhythm sound too if I go into the Lunchbox. I'll send you the "bigtone" bridge, it'd be nice if it finds a home. John will get a kick out of that too I'm sure. djon - I don't think the three head piezo adds anything extra to a floating bridge instrument with two contact points. I mount the twin head internally, on the soundboard where the bridge feet contact (or as close as bass bars, tone bars, bracing etc. allows). I mount the heads using blu-tak putty. Most luthiers super glue the heads in place. I use a switch jack through the tailpiece for an all internal, no exposed wire clean install. The two-piezo contact points makes sense, thanks for helping me see the obvious, Mandobart! The more I hear, the more I'm leaning toward both piezo and mic, internally. Don't mind the maintenance if I can get a good sound. Was watching some of Wremble's latest vids and saw that he has two pickups (a Stimer and a piezo of some sort?) and the sound is pretty darn good (here). Piezo's definitely have a particular sound to them. Personally I dont like the edge to them. Others feel differently.